Mendon Police made the arrest on Washington Street. State Police media communications director Dave Procopio said in a statement that Sgt. Remkus was not on duty at the time. He was suspended with pay after a duty status hearing at Massachusetts State Police General Headquarters on Wednesday. David Procopio, director of media communications for the state police, said Sgt. Dennis Remkus, who is assigned to the state police air wing, was suspended with pay after a duty status hearing at state police general headquarters Framingham on Wednesday. Mr. Procopio said Sgt. Remkus was arrested Sunday by Mendon police after a motor vehicle stop on Washington Street. He was off-duty at the time. He was charged with driving under the influence of alcohol. Florida: former Mass trooper wants ‘professional courtesy’ as a cop-out in attempt to kill you while DUI; Collier deputy hooked him up! This entry was posted in Arrest bookings, Cops arrested for Drunk Driving, DWI arrest photos, DWI Arrests by State and tagged David Procopio, Massachusetts State Police, Mendon Police, Sgt. 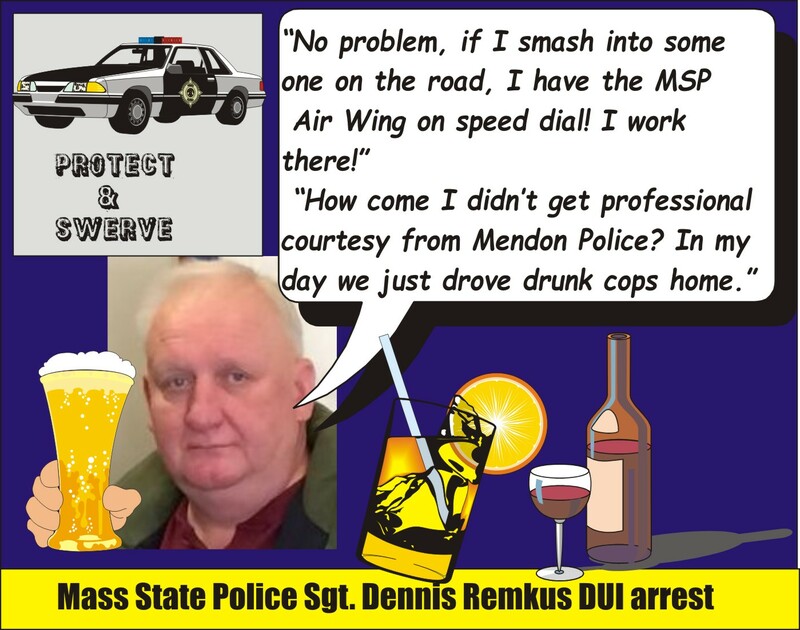 Dennis Remkus busted for DWI, Sgt. Remkus. Bookmark the permalink.